What kind of purposeless troublemaker doesn’t like to form a group to banish hunger? Not me. When it’s time to gather a committee, the best solution is Ad Hoc. Ad Hoc is the best way to experience the best in seasonal, artisanal chow (that you can’t source from a store) without breaking the bank or having to plan weeks ahead. As part of Thomas Keller’s gasterogod secret is that he gathers the best people and products. At AH, he has assembled the right crew with the know how and sourcing connections to make for food so simple that it’s incredibly complicated to duplicate. 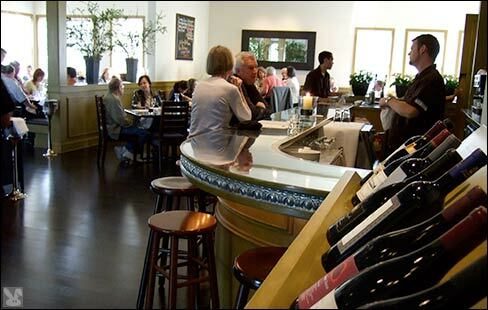 Atmosphere: it’s casual chic with diners in jeans or biz casual. There is seating at the clothless tables or at the bar. Stemless wineglasses reinforce the homey style. Service: don’t expect the French Laundry, this is family style with a looser approach, sometimes with duplicated queries from different runners. It is always friendly and they get the job done well. 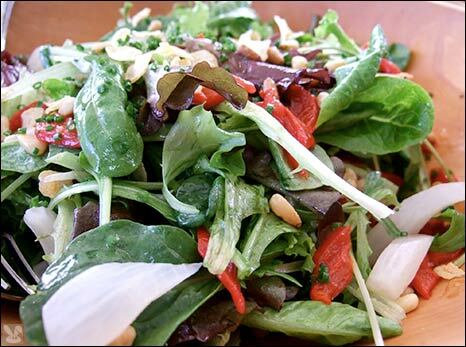 Salad of garden lettuces with peeled icicle radishes, toasted pinenuts, fried garlic chips, strips of piquillo pepper and snips of chive was a fresh and flavorful start to our meal. 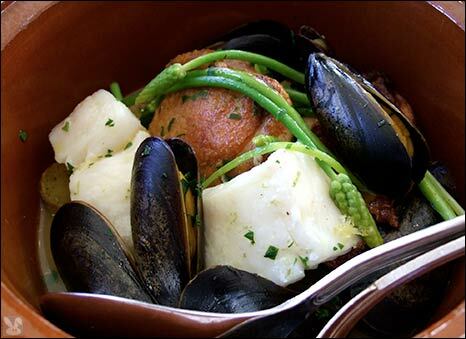 An earthenware vessel held a saffron broth that wedded poussin, halibut and mussels. 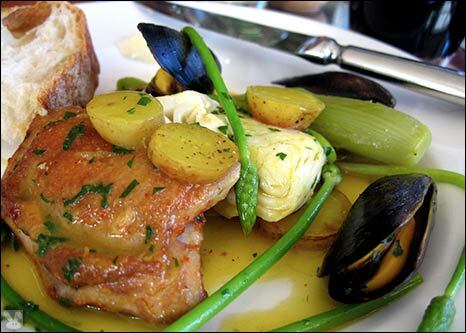 Wild asparagus spears and fingerling potatoes rounded out this combo of guess what? Chicken-'but (and mussels) had the freshest, most carefully sourced ingredients of anything you would find in such a casual setting. 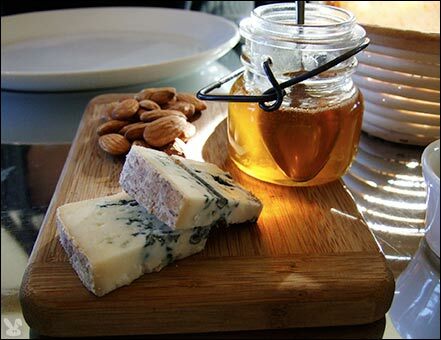 Gorgonzola Piccante, toasted almonds and Marshall's farm honey was an example of good sourcing. 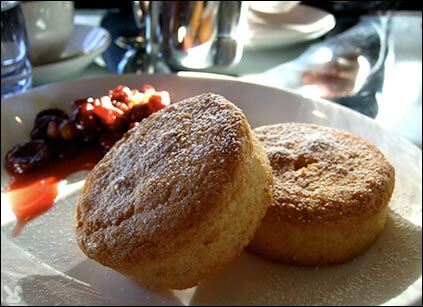 The Basque cake was served warm from the oven with a dried fruit compote. 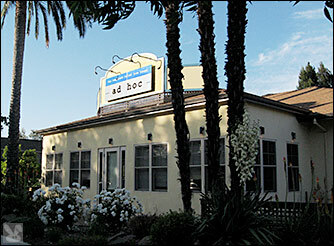 We love Ad Hoc. It's not the place to go if you have a restricted diet since there is only one set menu served each evening. There is only one thing that we Bunrabs do not eat (for obvious reasons) and we check the menu that day to insure that we do not become cannibals. You don't "sub" at "Ad". blogging-buddy Gutenberg, check out his blog on the subject! There are two large, clean, well stocked bathrooms. Entire contents copyright © 2007 by BunRabCo. All rights reserved.